Welcome to the Holy Women, Holy Men blog! We invite you to read about this commemoration, use the collect and lessons in prayer, whether individually or in corporate worship, and then tell us what you think. For more information about this project, click here. Hildegard of Bingen, born in 1098 in the lush Rhineland Valley, was a mystic, poet, composer, dramatist, doctor, scientist. Her parents’ tenth child, she was tithed to the Church and raised by the anchoress Jutta in a cottage near the Benedictine monastery of Disibodenberg. Drawn by the life of silence and prayer, other women joined them, finding the freedom, rare outside women’s religious communities, to develop their intellectual gifts. They organized as a convent under the authority of the abbot of Disibodenberg, with Jutta as abbess. 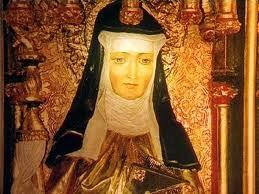 When Jutta died, Hildegard, then 38, became abbess. Later she founded independent convents at Bingen (1150) and Eibingen (1165), with the Archbishop of Mainz as her only superior. From childhood, Hildegard experienced dazzling spiritual visions. At 43, a voice commanded her to tell what she saw. So began an outpouring of extraordinarily original writings illustrated by unusual and wondrous illuminations. These works abound with feminine imagery for God and God’s creative activity. In 1147, Bernard of Clairvaux recommended her first book of visions, Scivias, to Pope Eugenius III, leading to papal authentication at the Synod of Trier. Hildegard became famous, eagerly sought for counsel, a correspondent of kings and queens, abbots and abbesses, archbishops and popes. Hildegard lived in a world accustomed to male governance. Yet, within her convents, and to a surprising extent outside them, she exercised a commanding spiritual authority based on confidence in her visions and considerable political astuteness. When she died in 1179 at 81, she left a rich legacy which speaks eloquently across the ages. God of all times and seasons: Give us grace that we, after the example of thy servant Hildegard, may both know and make known the joy and jubilation of being part of thy creation, and show forth thy glory not only with our lips but in our lives; through Jesus Christ our Savior, who liveth and reigneth with thee and the Holy Spirit, one God, for ever and ever. Amen. God of all times and seasons: Give us grace that we, after the example of your servant Hildegard, may both know and make known the joy and jubilation of being part of your creation, and show forth your glory not only with our lips but in our lives; through Jesus Christ our Savior, who lives and reigns with you and the Holy Spirit, one God, for ever and ever. Amen. New New Testament reading: This reading seems to fit the commemoration well. There are many possibilities for a sub-heading on the Propers page. I suggest “Abbess and Composer”, or “Abbess, Mystic, and Musician”. In line 2 of the first paragraph, I would add “and” before the last item (“scientist”) in the list of her accomplishments. In line 3 of the fifth paragraph, I would add “and” before “wrote” in the list of her activities. This appears to be another ommission in HWHM. LFF 06 lists the sub–heading as: ‘Abbess of Bingen and Mystic, 1179’. I had never heard of her until recetly. Now I hear about her all the time, She was certtainly a remarkable person who deserves to be remembered as more than a medieval feminist. The propers are appropriate. I would like to know more about her work. Sometimes Hildegard’s “strange and unheard-of music” all but transports me to a spiritual realm. It is such a blessing to honor this Spirit-filled woman. The Colossians reading is a welcome and appropriate addition.